Concentrated soup base for making flavorful miso ramen soup. 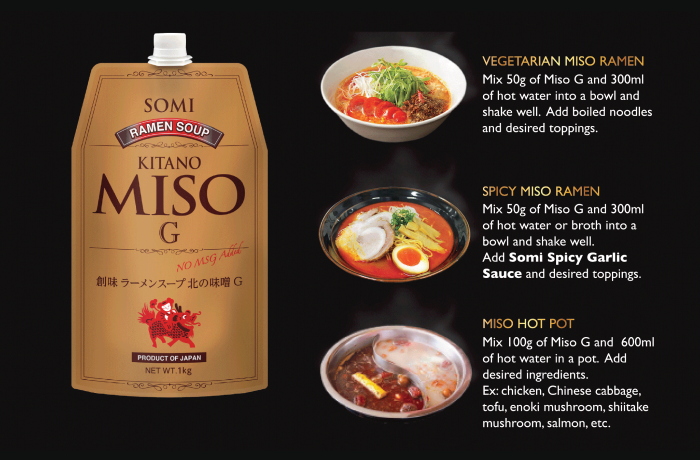 Carefully selected ingredients, including miso and vegetables, create a rich and deep flavor. Ingredients: Soybean paste (soybeans, water, rice salt), water, sugar, salt, isolated soy protein, garlic, canola oil yeast extract, hydrolyzed soy protein, ginger, cabbage extract, fried garlic powder (garlic, palm oil), spicy bean paste (chili, salt, rice vinegar, broad beans, wheat flour), chili oil (sesame oil, chili pepper), sesame.